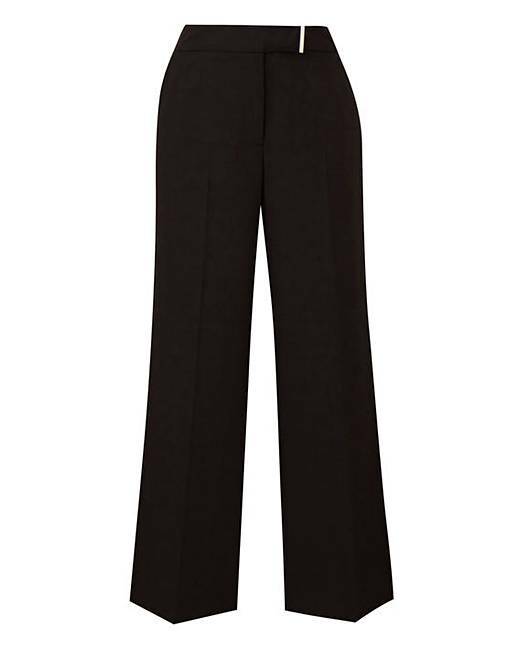 Workwear Wide Leg Trousers is rated 4.4 out of 5 by 12. A workwear essential. Features two side-entry pockets, a zip-up front and button fastening with a hook and bar and metal-trim detailing. Wear with our matching blazers JG166, JG168, JG211. Rated 5 out of 5 by pauline20 from Great flattering style. I really love this style very comfortable to wear I also have the same style in black. Rated 5 out of 5 by Bubbles from Great trousers I’m happy with these trousers. Comfortable and a perfect fit. Rated 5 out of 5 by pauline20 from Lovely comfortable style. I am very happy with these trousers so much so I've ordered them in another colour. Rated 5 out of 5 by Lou van from Comfortable smart trousers I bought these for work and being a teacher I don’t need designer trousers or prices! This is the second pair I have bought and will buy again! Rated 5 out of 5 by Tash79 from Lovely trousers Bought these trousers, at the moment the are a little tight around the waist but they fit lovely elsewhere and they hang really nicely. Just the right length too! Rated 5 out of 5 by Molly 666 from Love them! Good quality and an excellent fit. I have navy and grey. The grey are a little lifetime for me but that is the only thing I’m not keen on! They are well made.